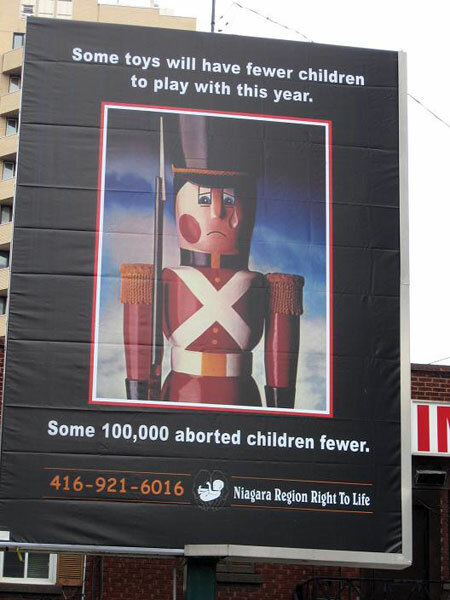 (Billboard in Toronto, via This is Hysteria). Think of all those teddy bears that will never be hugged!!11!!1!! This entry was posted on Thursday, September 9th, 2010 at 10:22 am	and is filed under Abortion, win. You can follow any responses to this entry through the RSS 2.0 feed. Both comments and pings are currently closed. And the even funnier thing is that seeing as most women having abortions cite a lack of resources to look after the potential child, their statement isn’t all that true either. Good point, I hadn’t even thought of that! But yeah, given the ridiculously overpriced toys that exist today…. This billboard is just begging to be parodied! Wow. That is stupid. LOL. A little photo shop and this one could work for us too!!! Ha, I like that idea! Maybe some sneaky editing and I could turn this ad around.